INNOVATIVE DESIGN - Multiple pockets hold credit cards, smartphone (including iPhone 6s, 7 plus, Galaxy), keys and other accessories. Easily listen to music with the headphone slit. Zip the front pouch when you don't need a bottle. Lightweight for jogging, walking dogs or a day at a theme park! Bottle can be carried on either side for LEFT-HANDED or RIGHT-HANDED use. USE YOUR FAVORITE BOTTLE - Fits most store-bought 12oz water bottles, as well as sports drink bottles like Gatorade and Powerade. Other products become useless when the bottle is lost, broken, or dirty - Not this one. Side bungee strap keeps bottle from sliding out. *Bottle is not included. 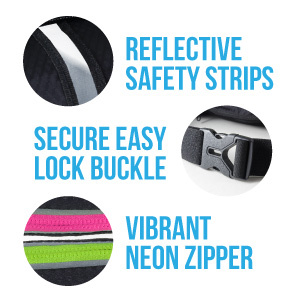 REFLECTIVE STRIPS FOR NIGHTTIME SAFETY - Multiple reflectors on the front, zipper and side make nighttime activities safer. For even more protection, use the side straps to hold a flash light or pepper spray bottle. 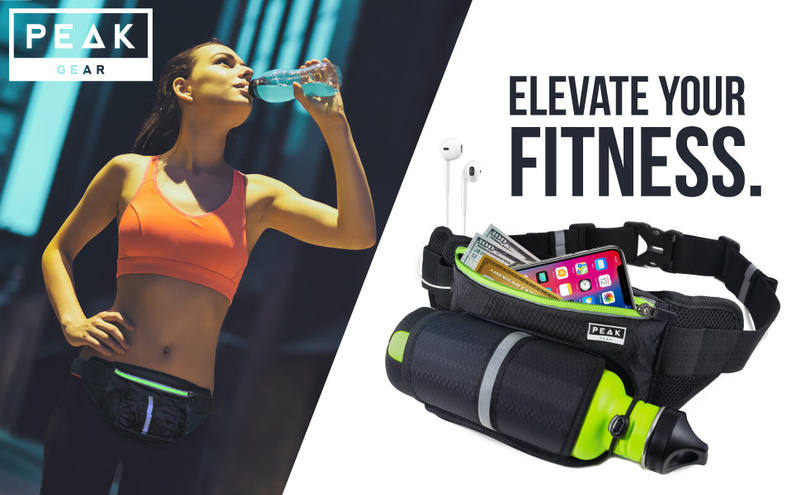 Enjoy your favorite activities without fussing with your belongings or a water bottle. Peak Gear has never skimmped on quality to save costs. Buy from a company that has a reputation for great products and service. Fits 26”-49” waists. Available with yellow or pink zipper. 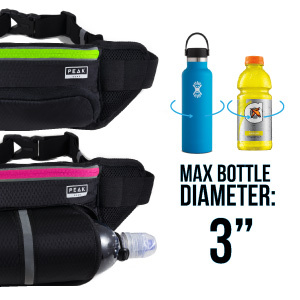 No more small, hard to clean water bottles that come with most running belts – Peak Gear lets you use your own bottle. Drink what you want and need - whether it’s a sports drink bottle or a store-bought water bottle. Other belts that include bottles need to be replaced when bottles crack or leak. Our belt fixes that problem and will last for years. Don’t need to take a drink – Simply zip up the bottle pocket and it’ll be out of your way. Stay visible to oncoming vehicles at night or in the early mornings with reflective strips on the front, side and zipper. Keep your hands free with a slim pouch that fits your phone, keys and other belongings. Hold a light or another safety device (e.g. pepper spray) where it can be easily accessed in the side elastic straps. Whether you are training for a half-marathon or simply going on a morning stroll, this belt is for you. 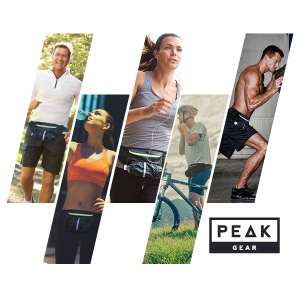 Runners and joggers will appreciate Peak Gear's slim design, rubber backing and multi-function elastic straps that can be used for gel-packs or energy bars. Peak Gear’s belt is also ideal for hiking, walking or cycling. You won't be disappointed with Peak Gear. We pride ourselves on exceptional service and top-quality products that are made to last. 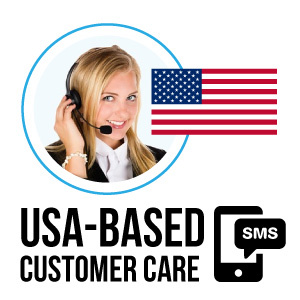 Our USA-based customer care team will make sure that you are happy with your Peak Gear product – Call, text or email with any questions or issues, anytime!